le shopper: a britique: Chanel Suit. '36 TWEED INDEED Even though she was a snob, Chanel loved tweed. The fabric was cheap, but she used the Duke of Westminster's factory and lined the jacket in fur to up the cost--and the status. '38 FITTING IN The stock-market crash changes everything: clothes become more formfitting and Chanel follows the trend, cutting her jackets with tight waists and full shoulders. '55 SLOUCH CHIC The shrugged-on silhouette came from Coco's first big idea of taking a lover's sweater, cutting it down the front and sewing ribbon on the edging. 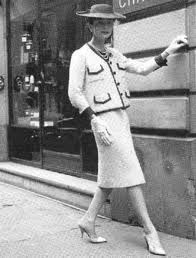 '60 COCO'S CLASSIC The contrasting-trim look emerges in 1955 and continues as a classic into the 1960s, when Chanel's suits become de rigueur for the ladies who lunch. '69 FLYIN' HIGH Model-actress Marisa Berenson wears a tweed suit (and has a pretty fabulous car), the ultimate symbol of status and wealth, circa 1969. '70 LOST DECADE After Chanel's death in 1971, the studio is led by her former assistants. Cheryl Tiegs and Catherine Deneuve are hired to jazz things up, but it doesn't work. '86 POWER look "Chanel established a look that is for our century what the two- and three-button suit is for men," Lagerfeld said in 1989. The tweed suit comes back into power in the '80s. '90 HANG 10 Lagerfeld surfs past the competition by combining the language of Chanel with the patois of the street and cutting the jacket into surf-inspired shapes. '95 COCO LOCO Lagerfeld appeals to rappers like TLC's late Lisa (Left Eye) Lopes, left, and Rozonda (Chilli) Thomas, who delight in the modern take on the Chanel jacket: the Windbreaker. '96 I, CLAUDIA Just when the Gap thought it had cornered the market on cool, Claudia Schiffer--a longtime Lagerfeld favorite--stalks Chanel's runway in a pair of khakis. '01 DETAILS, DETAILS Chanel was a nut about armholes, but she never felt she got them right. Celebrities like Gwyneth Paltrow take to Chanel's tiny tweed jackets at the turn of the century. '03 GIRL WITH PEARLS As the fierce and flirtatious Elle Woods, Reese Witherspoon calls on the classics and brings big Chanel pearls to the big screen in Legally Blonde 2: Red, White & Blonde. '03 HARD AND SOFT Nobody balances rigor and delicacy like Lagerfeld, who combines lightweight embroidered tweed suits with metallic boots for his fall 2003 couture collection. NEW-LOOK LAGERFELD Just in time for his 20th anniversary at Chanel, Lagerfeld goes on a yearlong diet and gets thinner and thinner, dropping a total of 90 lbs. I know you all didn't mind the minor history lesson. I'm just addicted to learning as much as possible about the great.